Not all devices are created equal, and this can be seen with the ToughArmor MB998SK-B which skews the realm of possibilities. 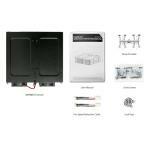 It boasts the ability to house an unprecedented 8 x 2.5” SATA drives with 5mm to 7mm height into a single external 5.25” bay, making it the ultimate solution for storage dense applications. Our unique hot-swappable 2.5” EZ Slide Nano trays let you painlessly and quickly swap out drives. 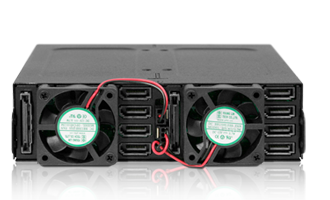 Dual 40mm fans keep your drives nice and cool while ventilated openings located on the front and sides maximize airflow. The MB998SK-B features a rugged heavy duty full metal housing which is commercially designed for Medical & Military systems, IPC, enterprise, and industrial settings. 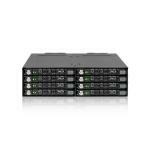 Utilizing the standard external 5.25” bay form factor, the compact design allows the cage to be used in various applications such as advanced RAID. 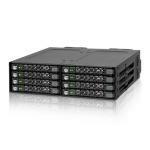 With the MB998SK-B it’s possible to build dual RAID 5 or RAID 10 arrays or use 4 drives in a high performance RAID 0 array plus two RAID 1 arrays for backups. 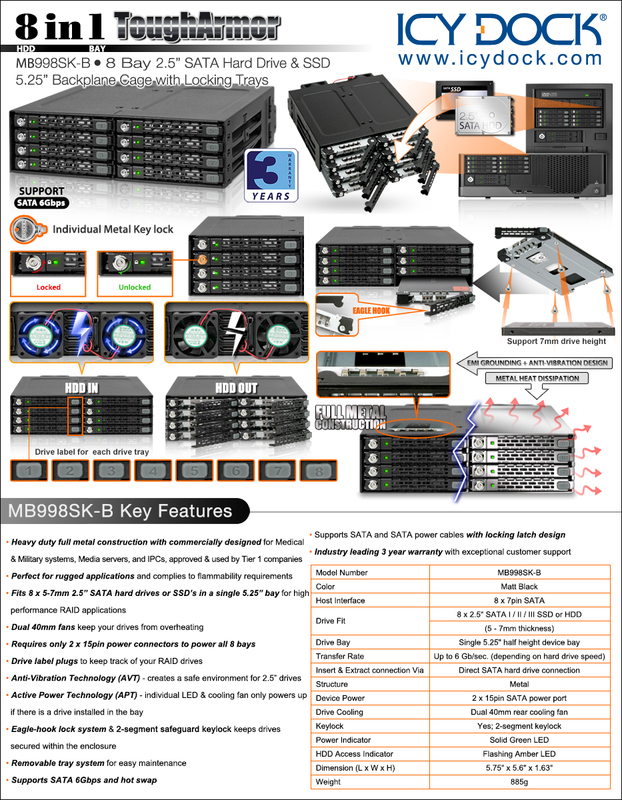 The MB998SK-B is extremely useful for workstations, compact servers, gaming rigs, home servers or HTPC’s due to its high capacity and space saving design. 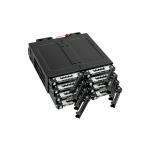 It is also perfect for users that need non-RAID JBOD storage to save different content in different drive locations. 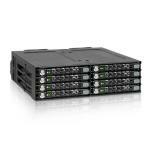 It supports a wide-range of applications which makes the MB998SK-B invaluable. Ensuring the safety of your valuable data is the foundation to any good system build or design. The MB998SK-B is capable of holding up to the most demanding environments with its rugged heavy duty full metal construction in the entirety of the body and its smaller components. The ToughArmor's rugged full metal design is also perfect for industrial and medical devices that may require a flammability rating as the full metal material is considered to be already compliant with flammability requirements. 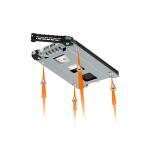 An all metal design also dissipates heat from the hard drives to the backplane cage resulting in cooler drives. 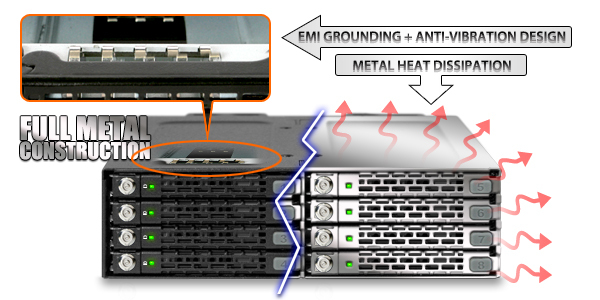 Lastly, Anti-Vibration Technology (AVT) and EMI grounding are used to ensure a stable environment for the hard drives or SSD’s used, dramatically improving reliability.